Since last summer, I've wanted Thea to have a play kitchen. I looked at dozens of ones for sale before deciding that I wanted to make one myself. 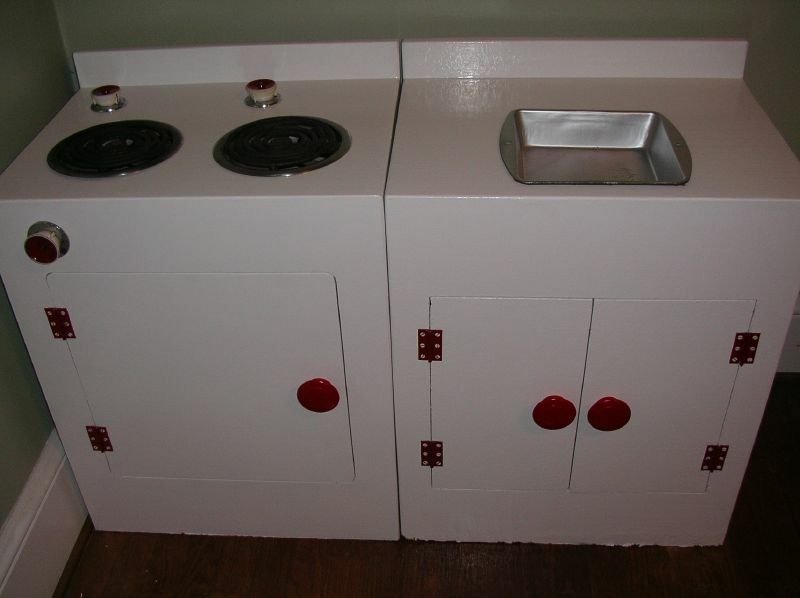 A friend pointed me to ohdeedoh and their roundup of DIY play kitchens. I fell in love with this one first. Then I found this one and this one and this one on flickr. I searched local thrift shops, consignment stores, and craig's list for a piece of furniture to repurpose, but nothing was quite right - everything I saw was either too big or too small, or otherwise wouldn't work. So, I decided to make it from scratch. Thea's finished kitchen measures 18 x 32 inches and is 37 inches high. I started out with 1/2 inch plywood. I took my measurements to the hardware store and had them make some initial cuts. Then, my mother-in-law let me borrow her jigsaw and gave me a lesson on how to use it by helping me cut the hole for the sink. Most of the kitchen was assembled using some heavy-duty screws and my drill. I used L-brackets to secure the panel dividing the oven from the area under the sink. I decided early on that I wanted the top to be curved. I used the back of an antique buffet that we have in our kitchen to make a template for the backsplash. I used the jigsaw to cut the back of the kitchen as well as the window for the oven door. I drilled plexiglass to the inside of the oven door. The oven handle (and the towel rack on the side of the kitchen) are cabinet handles from the hardware store. The oven door is held shut by a magnet designed for cabinet doors. I am still working on finding something just right for the oven rack, and I hope to add that in the next few weeks. It was important to me that the knobs be something that Thea could twist and turn. After experimenting with a few different ideas, I ended up getting a set of replacement oven knobs and using dowels (and hot glue!) to hold the knobs in place. (I drilled holes slightly larger than the dowel to allow them to turn). I added a small wire shelf under the sink for a little extra storage. The curtain is made of vintage fabric from a sweet little etsy shop - craftvintage. I added some blue and green gingham fabric to the bottom. A simple tension rod holds it in place. I had originally planned to have a shelf similar to this one attached to the backsplash. I even found one at the local thrift shop. But once I started figuring out the sizing of everything, I decided that the shelf would make the back of the kitchen too tall. When I saw the shelf on this kitchen, I instantly loved it. I used the same template I had used for the backsplash to make the shelf. (I used the jigsaw to make the cuts). The cooktop is a 1/4 inch piece of plywood. After it was primed and painted black, I used a white wood paint pen to create the burners. With the paint pen, I traced around two circle templates I made out of cardboard. To keep it nice and secure, I drilled the cooktop to the main body of the kitchen. I have to say that while I made the kitchen myself, I couldn't have done it without my sweet husband, who kept Thea occupied for hours and hours while I worked. It also would not have been possible without my mother and step-father generously allowing me to take over their garage. My mother-in-law's jigsaw was absolutely essential. And my fantastic friends Michaelann and Beth provided endless support, encouragement, and ideas. So in truth, this project was not done alone. And Thea loves it. What more could I ask for? Your grandchildren will play with it someday...my dad made these about forty years ago. How beautiful. The work of your hands! seeing this makes me think of the indigo girls song, "hammer and a nail." you have definitely learned how to use those hands. beautiful work! I am so impressed by how amazing your kitchen it. I just love it and I still can't believe you did it all yourself. You are such a power crafter!!! you rock! i love love love this kitchen so much. you did an amazing job!! Holy cow!!! It's gorgeous!!! I'm so impressed, I don't even know what to say! this is so, so awesome...oh my! Those are so wonderful! How fantastic to have something passed from generation to generation. Jack can come play anytime! amazing work, nikole! i love it! It's amazing! I LOVE LOVE LOVE it! You are gifted! Love the new site. I love your new online home! I have enjoyed following your journey thus far and will continue to enjoy sharing in your life. Beautiful creative projects that you have posted! You are inspiring me! Blessings to you! Of course I'll be happy and honoured to be able to follow you in this new blog/new phase of your life. And, of course, I am totally amazed with the kitchen... Wow!!! You are a great mum!!! Congrats! Nikole, I've been hearing lots about this project from John and I'm so glad to see the finished piece. This is amazing! What a lucky, lucky girl Thea is. The cookies and pasta you made for her to play with are simply the best. You are so talented. I hope we have the chance to meet in person at some point! The kitchen looks great! Well done! Thanks for linking to my photos - Stella loves her play kitchen too! Thank you Thank you!! Those are so cute and look a lot easier to make then the fabric ones I have made in the past. Can't wait to try it out!!! thanks for the inspiration. and i do enjoy reading your blog.